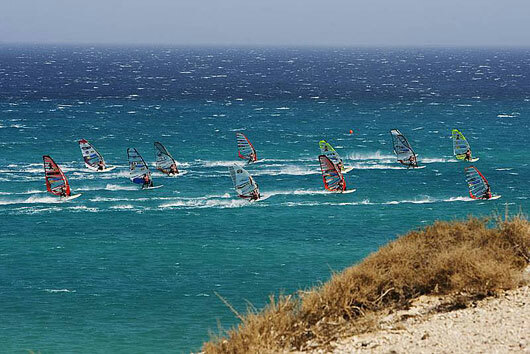 It was a greta time competing on Gran Canaria and at Fuertevntura in the PWA Slalom events. In both events I started quite bad and could improve a bit while the events. We had 24 eliminations, which got counted and one more, which got started, but not finished. I did not use my smallest sail, the 5,1 in one single elimination. Most of the time I used the iSonic 86 plus a Vector Canfire 32 and the Code Red 5,4, which is an awesome sail for high wind conditions up to 45 knots. My biggest success was to compete in race 10 at the Fuerte Slalom: I made it to the loosers final and finished 8th in 40 to 45 knots. I must improve my acceleration and speed and for sure the jibes. The next event will start in Alacati, Turkey on the 10th of August. Some time for traing is left. The start in race 10 (pic: John Carter / PWA worldtour 2009).